More often than not, we rely on our own personal experience when planning trips. When we go to work, visit friends, or drive to the airport, we make choices based on our previous experiences. 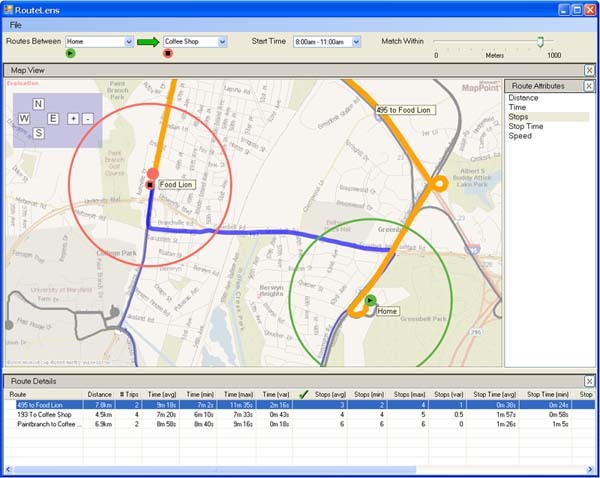 RouteLens is a tool to help users choose the best route for their common trips based on their personal driving history. Each time an individual drives along a route, the system records the history of their trip. Once they have driven a sufficient number of trips, they will be able to see trends in travel time, stop frequency, number of stops, total stopped time and speed. Drivers might also care about the intangible characteristics of a route. They might want to avoid high-crime areas, or find the most scenic route. So, we will allow them to annotate their routes with other useful information. Finally, letting drivers share their personal history with others will help them build a broader picture of their local driving network. So, we will aggregate data from the broader user community. Before building RouteLens, we conducted a web survey to see what potential users thought of the idea and to determine the right tasks to support. NOTE: Results will be posted here soon. Bederson, B.B., Clamage, A., Plaisant, C.
Proc. of the Transportation Research Board 87thannual meeting. Proc. Interact 2001, IFIP IOS Press, (2001), 799-800. This work is sponsored in part by a generous grant from Microsoft Research.